Rick Gervais on his tv show After Life, singer Tom Walker performs live, Andre Previn remembered, Charlotte Eyre and Crystal Mahey-Morgan on the decline of young adult literature. In his new series After Life, Ricky Gervais plays a local journalist who tries to find humour as he struggles in the wake of his wife’s death, with a dog as his closest companion. Gervais discusses how he copes with people’s reactions and offence at his work and the controversy surrounding historical social media posts and celebrity redemption. Tom Walker, winner of this year’s British Breakthrough Act at the Brits, performs his new single Just You and I live in studio. He describes his music as a mix of “hip hop, a tiny bit of blues, a bit of pop with a splash of reggae” and his debut album, What a Time to be Alive, has seen him collaborate with producers such as Naughty Boy and Steve Mac, who has worked with Ed Sheeran. Critic and broadcaster Norman Lebrecht looks at the life of the late composer, conductor and pianist Andre Previn. With the sales of young adult literature falling by a third in the last year, Charlotte Eyre of the Bookseller and publisher Crystal Mahey-Morgan discuss the reasons for the drop and where potential for the future lies for these books. 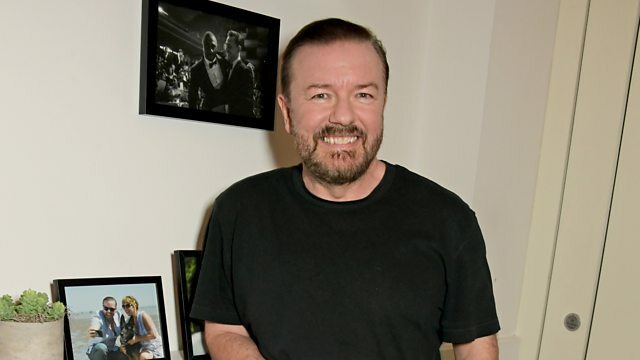 Season 1 of After Life starring Ricky Gervais is available on Netflix from 08 March 2019. Tom Walker's album What a Time to Be Alive is out on 01 March 2019.